We hadn’t got a great deal of sleep, but we’d had some rest and weren’t feeling at all sea sick. We decided to start the day with half a sea-sickness tablet each and then try to finally get our sea legs. We hoisted the sail (David’s method again working a treat) and set off up the coast, determined to hug the shoreline as close as we could to stay out of the pesky Eastern Australian Current. There wasn’t much wind, but we spent a pleasant couple of hours sailing along the beach, occasionally bumping over some of the curious steps in the sea level that are common hereabouts. Presumably the edges of underwater currents or rips, they are marked by trails of spume – often yellow – and a noticeable drop of several inches. 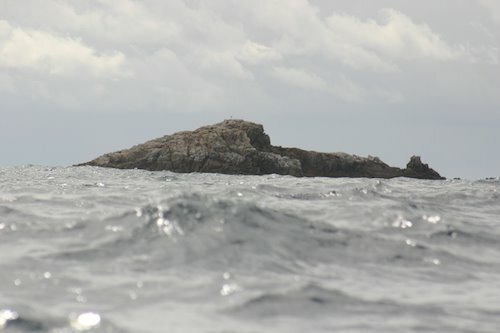 Our first navigation point was called Fish Rock, and it did look extraordinarily like a prehistoric lobe-finned fish, crawling out of the sea on its way to evolve some lungs. At about lunchtime, though, the wind died completely and we reluctantly started the motor. Motoring on passage is very tedious; the boat pushes through the waves rather than moving with them, and we have to hand-steer because Harriet the Hydrovane needs the wind to function. Admittedly this is rather my fault; we do have an Autohelm unit that will automatically steer us under power, but I took it apart some months ago to fix a rattle, and never got around to putting it back together again. I hereby move it closer to the top of my list of “things to do when it’s quiet”. On the other hand, Bronwyn took advantage of the gentle chugging to proof some dough and bake some bread and a pizza for lunch. After a splendid meal, we not only got our wind back, but also hit the semi-mythical northern current, a retrograde offshoot of the Eastern Australian that allegedly and occasionally runs northward close inshore. For the first time, our speed-over-ground was higher than our speed-through-the-water. The rest of the afternoon passed with alternate sailing and motoring until dusk, when we began to think seriously about stopping for the night instead of continuing with a night passage. Although the roadstead anchorage at Hat Head had given us a break and we weren’t feeling at all sea-sick (hurrah!) we were not feeling particularly enthusiastic about losing another night’s sleep, so we decided to stop at Coffs Harbour. Our cruising guide said that although the anchor holding at Coffs was terrible, there were courtesy moorings inside the harbour. We were really grateful for our excellent new charts. Coffs is a blaze of vari-coloured and flashing lights, not only navigation markers but also multicoloured aircraft beacons and a plethora of lights on the shore. As we approached, we slowly ticked off all the different lights on our chart until we finally sorted out the wheat from the chaff, rounded the beacon on Korfs Islet and picked up the clear lead lights into the harbour. There’s no real bar at Coffs, and we surfed gently in on a swell. There were no courtesy moorings. We tried to drop the anchor a couple of times, but the bottom seemed to be hard and flat and we couldn’t get it to bite. We called up the local Coastal Patrol on the radio, and they confirmed that there weren’t any moorings and suggested that perhaps we could try the fishermen’s public jetty inside the marina. We had a look and then squeezed in front of a large fishing boat, hard up against some massive wooden pilings constructed for boats made of steel and twice our size. Bronwyn did a fine job of manoeuvring us in under the amused and somewhat inebriated eyes of the fishermen. After that we slammed into the jetty a few times because there was a tricky swell that alternately pushed us into the un-fendered pilings and then dragged us away. It was a bit of a juggle to get the mooring lines right, but eventually I was happy and we grabbed something to eat and went to bed. We’d come in on the top of the tide, so as usual I set the alarm for the falling tide so that I could get up and check the lines. However, this wasn’t necessary because the low was heralded by a loud “crash” as our inflatable fenders shifted away from the pilings and allowed us to slam into the battered and pitted wood. After that, I was up and down every hour or so, discovering by trial and error that the best plan was to leave the fore and aft lines alone and simply play with the springers as the level changed. Finally the tide came back in and everything calmed down. I was just drifting off into my first deep sleep of the night when we were awoken by “Oy! Is anybody aboard? This is a working jetty, you know!”. It was a fishing charter arriving early to pick up passengers. He was hoping that we could move up a bit to let him squash in behind us, but I really couldn’t see how we were all going to fit, so we just cast off, motored into the main harbour, and bobbed about while we ate breakfast and prepared the boat for sea. This entry was posted in Australia, Oceania, Travel, Voyage of Pindimara and tagged Sail on 2009/04/09 by Reinhard.